We approached Rocky Mountain National Park from the east, our research having indicated that the other options would entail steeper and twistier climbs and downhill grades. 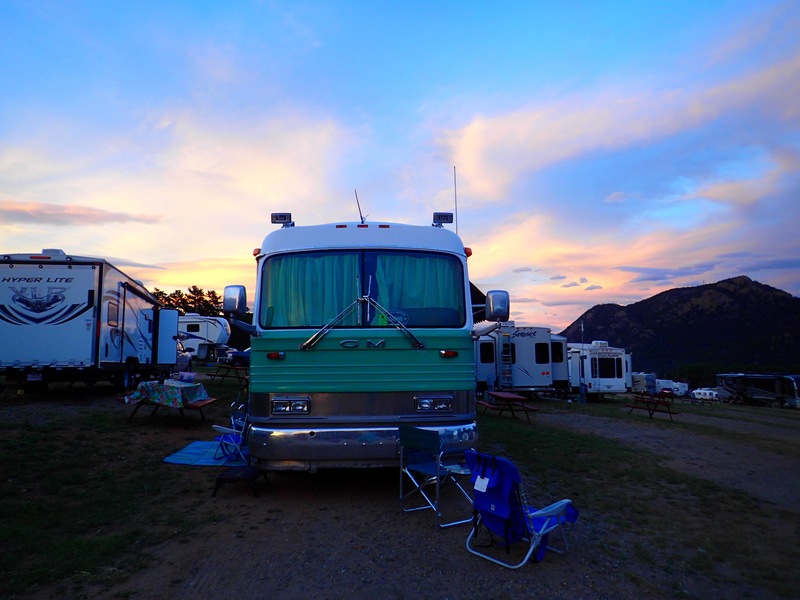 Further, we stayed in a private RV resort, Elk Meadow Lodge and RV Park, just on the edge of RMNP in the touristy town of Estes Park. RMNP operates a shuttle system, and Elk Meadow is quite close to one of the shuttle stops, so it worked out perfect for us. Given the size of our rig, the nature of the roads actually inside RMNP, the difficulty in securing reservations at the actual RMNP campgrounds, and the questionable quality of some of the subcontracted full service RV sites in other national parks, the private park was our best option. 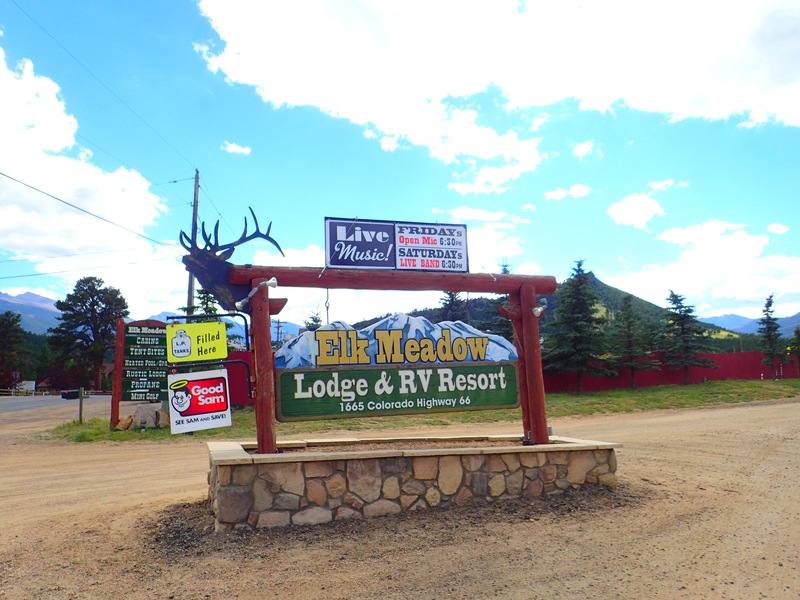 Elk Meadow Lodge is full hook up, with reasonably spacious and level sites, though we found the positioning of the service connections quite awkward. The electrical connection was so far back in the site that we had to reverse all the way to the edge just to allow our shore power cable to reach. The TV cable connection is similarly positioned, and a 25′ coax was insufficient to reach it from our connection point on the side of the bus. Fortunately, Elk Meadows is focused on excellent customer service, and they went out of their way to solve any problem we brought to their attention. The maintenance staff went beyond expectations, finding me a cable extension with a female to female adapter. They offered to move our spot if the electrical connection did not work. And when I mentioned that their internet was “RV park typical,” i.e., generally unusable in our location, they pointed me to the sitting area next to the antenna for their alternate network, giving me the password for the wifi connection usually reserved for employees. 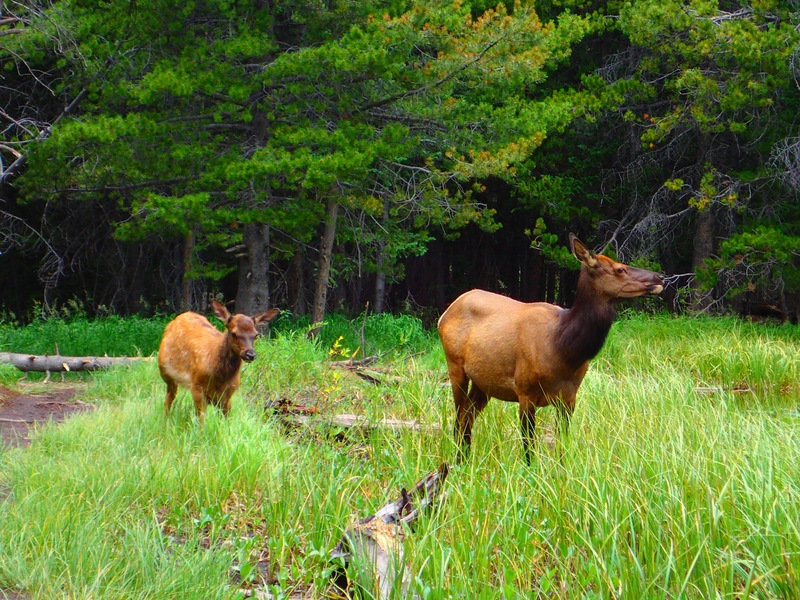 Elk Meadows is definitely operating in the RV Resort field rather than just a plain RV campground/park. In addition to the nice sites and excellent customer service, they have a pool, large playground, putt putt golf course, bar/restaurant, and live music venue. 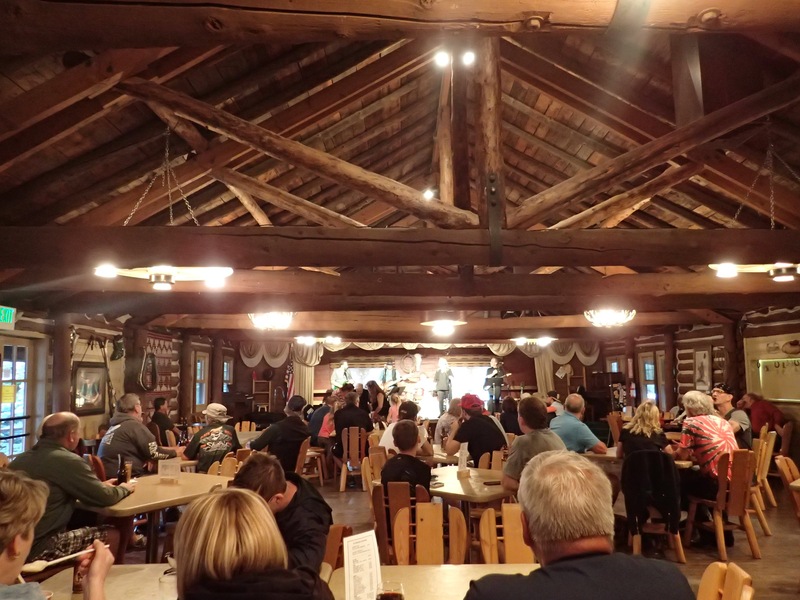 On our third night we attended a high energy live music event, mainly classic rock covering several decades, from a quite competent and enjoyable band in the lodge. Though the RV resort was great, we were there for the national park. As mentioned above, RMNP operates a shuttle system, though unlike in Zion, the park does not restrict private vehicle access, the shuttle operates merely as an alternative. We knew from google maps that Elk Meadows was the closest private park to any of the shuttle pick up points, but after consultation with the Elk Meadow staff, we learned that if we walked to the rear of the resort and stepped over the low wood fence, then we had only a quarter-mile roadside walk to the Beaver Meadows visitor center and shuttle pick up point. Thus we were able to view both of the park movies, explore the learning center, and consult with the park rangers about hikes on our first full day. We headed up to Bear Lake, adjusted our plans based on conversation with the shuttle driver and other hikers, and undertook a four mile round trip hike to visit three crystal clear lakes: Nymph, Dream, and Emerald. Each lake was more fantastic than the last, all were brimming with salmon, and surrounded by shamelessly begging ground squirrels and chipmunks. We were fortunate enough to pass Nymph Lake right as an elk and her faun were drinking from the edge of the lake not 50′ from the trail. 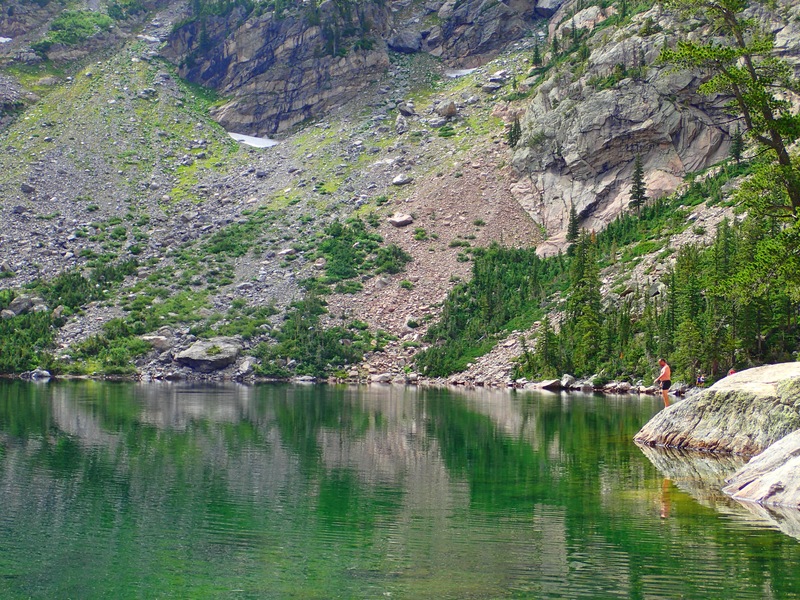 And of course, I was able to take my usual swim in the less crowded Emerald Lake at over 10000′ altitude. The water was deceptively cold, with the top foot or so being quite tolerable, but a rapid thermocline led to bone chilling water a few feet below the surface, which I discovered too late after my dive from the rocks. About to take the plunge from the rock to the right. The next day we took a different shuttle line to the Fern Lake trail head and did a six-mile round trip hike to Fern Falls. We connected with a lovely couple of hiking and park enthusiasts, John and Doe, for most of that hike, which gave us some much needed social interaction as well as kept Rosemarie’s photo taking down to a reasonable level, stopping once every 100 feet rather than every 10 feet for pictures. A real win-win for me. 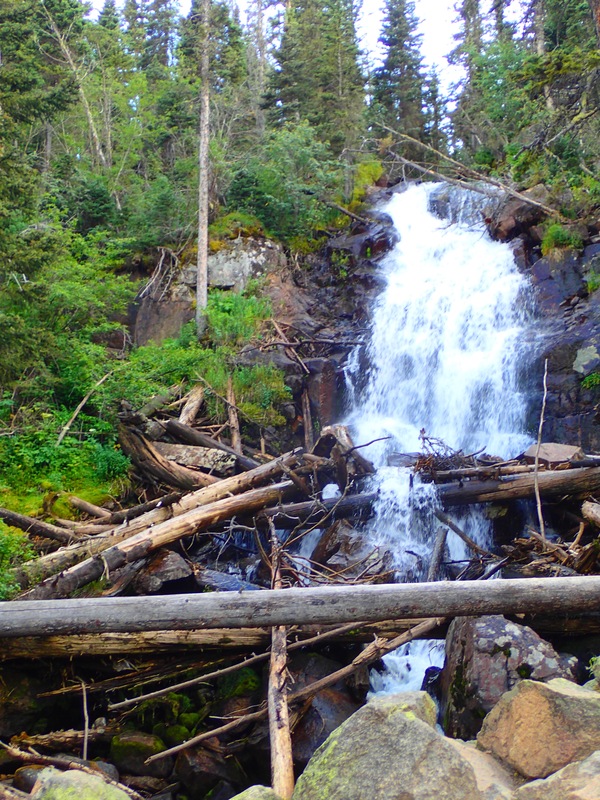 While the company was great, the hike was not nearly as pleasant as the previous day’s Emerald Lake loop, and if you have only one day of hiking I would recommend the Bear Lake area rather as a priority. We had timed our trip badly, just missing the return tip bus, having to wait half an hour for the next, which only took us to a connection stop and another hour of waiting for the final leg of the trip home, Fortunately one of the park shuttle drivers was finishing his shift and offered all four of us a lift home since he was headed that way. We spent part of our last day in the town of Estes Park. It is very touristy, with gift and ice cream shops seemingly every 20 feet, but much of the downtown runs right beside a river and is very cute with lots of pedestrian friendly activities and cafes. RMNP was a great stop for us, particularly the fantastic service at Elk Meadow, the park shuttle service, and the incredibly beautiful day hikes.